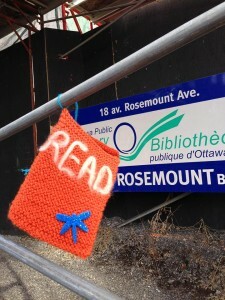 Today the Rosemount Expansion and Development (READ) group “yarn bombed” the Rosemount Avenue Branch of the Ottawa Public Library with an installation piece, Rosemont Yarns. 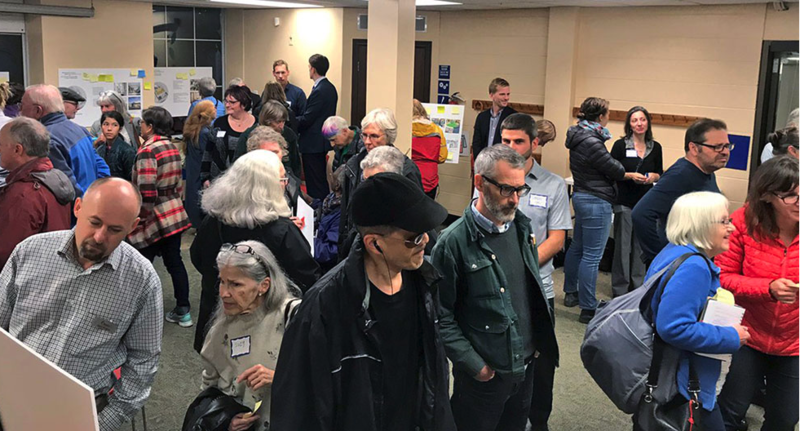 In the lead up to the public consultations regarding the future of the Rosemount Library, knitters from across Kitchissippi Ward and the city have created over one hundred and seventy-five knitted books and hearts to illustrate their their library. The Rosemount Yarns installation demonstrates the community’s love of reading, love of books and love of all the Rosemount library’s programs and services. The practice of yarn bombing (sometimes known as guerilla knitting) is a fun, eye-catching and creative way to raise awareness, in this case about upcoming public consultations on expansions and improvements to the Rosemount Avenue Branch. Rosemount Yarns draws upon the tradition of transforming urban landscapes by decorating everyday objects with colourful knitted and crocheted works. Special thanks to Michelle Taggart and Tamarack Wellington for granting READ permission to use some of their scaffolding for the installation.